This week's wedding of Gamal Mubarak and the reception planned Friday night in the same beach resort as an Iraq summit have thrown new attention on the younger Mubarak's controversial political role here. 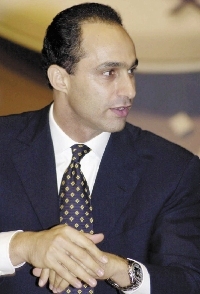 Gamal Mubarak, the son of President Hosni Mubarak, who has ruled with authoritarian powers for 26 years and turned 79 on Friday, has denied any interest in running the country. In an interview Tuesday, he repeated that, telling the private Arabic satellite TV channel, Orbit: "I'm not looking for any executive post." But key leaders in his father's ruling party clearly want him to succeed and many Egyptians think his eventual succession is a given. Even his wedding, which the family has insisted is purely private, added to the controversy: Some Egyptians think it was carefully planned to ensure the 43-year-old former investment banker meets the expected family-man model, in a society where most men marry in their 20s or early 30s. A small protest Friday in Cairo's main square was indicative of the behind-the-scenes mood, even as the reception neared at the posh Four Seasons Hotel in the Red Sea resort of Sharm el-Sheik. Organizers said the main slogan for the protest was "marry her and not our country." Friday's wedding reception guest list was not released. But U.S. officials said U.S. Secretary of State Condoleezza Rice did not plan to attend, instead jetting home to Washington after the summit's end. Gamal Mubarak and his bride, 24-year-old blonde Khadiga el-Gamal, were officially married several days earlier, on Saturday, in a religious marriage ceremony conducted by the grand sheik of Al-Azhar mosque, held at an air force reception hall in Cairo. According to independent Egyptian newspapers, Egypt's powerful intelligence chief, Omar Suleiman, was the official witness a role often played in Egypt by a favorite uncle. No photos were published and state-owned media said only family attended. But opposition papers and blogs claimed 500 guests attended, and speculated about the cost of the bride's wedding dress and ring. Gamal Mubarak said in Tuesday's interview that family and friends would gather for the Friday wedding reception and that a famous Egyptian singer, Amr Diab, would sing. Nevertheless, even the venue in Sharm el-Sheik had a political overtone, because the elder Mubarak is often criticized as being out of touch with his country _ with the long periods he spends at the beach resort offered as prime evidence. Mubarak's wife does not wear a Muslim head scarf, in contrast to an estimated 80 percent of Egyptian women, and neither does his new daughter-in-law. But the biggest complaints against the government involve reforms, political and economic. Egypt undertook some small limited democratic reforms in 2005 under strong U.S. pressure. Reform groups launched several protests against the elder Mubarak then. But in the last two years, the reforms have withered and a recent round of constitutional changes are seen as expanding the ruling party's dominance, not opening the door to challengers. Likewise, the country has undertaken a handful of economic reforms but remains far more stagnant than its booming, investment-rich Persian Gulf neighbors. Unemployment remains officially at 12 percent, and the poverty level near 20 percent, according to the World Bank. Corruption is rife. The elder Mubarak has marginalized any real political challengers, leading to the speculation about his son. Gamal Mubarak's swift rise through the ruling party's hierarchy has alarmed Egyptians who detest the idea of a father-son succession, as happened in nearby Syria. Makram Mohammed Ahmed, a veteran journalist known to be close to the president, said he believed the president and his son "when they say that Egypt is not like Syria and that succession is not taking place." "I believe that there are plenty of obstacles facing the succession, including the army," he told The Associated Press. As for criticism that the wedding reception somehow was timed to coincide with the Iraq summit, Mubarak supporters scoff at the idea. Osamal Saraya, the editor in chief of the state-allied Al Ahram, said it was unfair to target Gamal Mubarak's personal life. "He is paying a heavy price for being the president's son."